Mel B just never knew there'd ever be a Spice Girls reunion. I just love having first crack at some of these pictures. Leave as many captions as you like. I don't know what kind of captions you're going to leave. Why don't you tell me what you want, what you really, really want. If you had fun here, then get yourself over to Screaming MeMe's for more crazy captioning. The battle of the sodas were out fizzed this year by newcomer and former Biggest Loser contestant, Lola the Big Cola. One of these drinks is not like the others. Well I, for one, am appalled that Dr Pepper is not represented here. 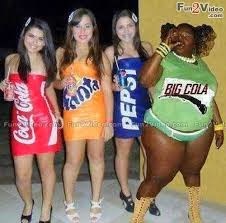 I guess there's nothing for it except for me to give Ms. Big Cola a run for her money in one of those outfits. bet that Toronto mayor would have something to say! I've been known to take a Coca -Cola or Fanta to bed, and maybe even a Pepsi. But the lat time I took a Big Cola to bed, I was up all night.